Autumn, 1565: When an actor's daughter is murdered on the banks of Kyoto's Kamo River, master ninja Hiro Hattori and Portuguese Jesuit Father Mateo are the victim's only hope for justice. As political tensions rise in the wake of the shogun's recent death, and rival warlords threaten war, the Kyoto police forbid an investigation of the killing, to keep the peace--but Hiro has a personal connection to the girl, and must avenge her. The secret investigation leads Hiro and Father Mateo deep into the exclusive world of Kyoto's theater guilds, where they quickly learn that nothing, and no one, is as it seems. With only a mysterious golden coin to guide them, the investigators uncover a forbidden love affair, a missing mask, and a dangerous link to corruption within the Kyoto police department that leaves Hiro and Father Mateo running for their lives. Susan Spann is the 2015 Rocky Mountain Fiction Writers’ Writer of the Year and the author of three previous novels in the Shinobi Mystery series: Claws of the Cat, Blade of the Samurai, and Flask of the Drunken Master. She has a degree in Asian Studies and a lifelong love of Japanese history and culture. When not writing, she works as a transactional attorney focusing on publishing and business law, and raises seahorses and rare corals in her marine aquarium. 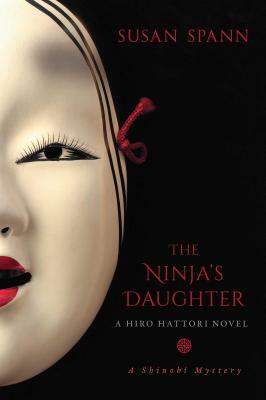 "While Spann demonstrates admirable attention to detail in her ninja detective debut, it's the contemporary tone of her prose that makes this intriguing 16th-century historical so accessible." "Spann displays her knowledge and expertise while presenting a fascinating and complicated mystery. This is fun, historically entertaining and a very good book." "An excursion into 16th century Japan where exotic locales take on a familiar flavor as a samurai investigates a murder....It's an intriguing tale with dramatic descriptions and vivid characterizations, revealing that love, jealousy, and greed not only are universal emotions, but also remain unchanged by the centuries." "An outstanding historical mystery set in Japan during the shogunate...What adds to the enjoyment of the history is a most elegant mystery that grows out of the politics of the time... All this is told in stripped down prose as we edge carefully through the thickets of confusion and emerge on to the plain of revelation as the killer is unmasked and uncertainty over the threat to the shogun is resolved." "Hiro and Father Mateo's second adventure combines enlightenment on 16th-century Japanese life with a sharp and well-integrated mystery." "After her exciting historical mystery debut, Claws of the Cat, Spann proves she has the touch in her sophomore entry. The deceptively simple prose educates readers about 16th-century Japan, while the well-plotted story moves at ninja speed. The endearing characters fight to defend honor and truth, giving this strong YA appeal." "Spann's third historical set in 16th-century Japan offers an accessible entry into the country's fascinating history and culture. ... An added draw are Hiro and Father Mateo, who make a remarkable crime-solving team." "Like earlier series entries, this one is most likely to interest readers with tastes for political intrigue in 16th-century Japan and red herrings."